Since I first went to Paris in 2012 I discovered a love for something that is made from the simplest of ingredients. A macaron. I had seen them in the movies, on photoshoots and spread across luxury food magazines but I had never had one until the day I went to Ladurée on the Champs Elysees. Since then I have had a severe obsession, grabbing one or two from any Ladurée I see or basically any macaroon shop. 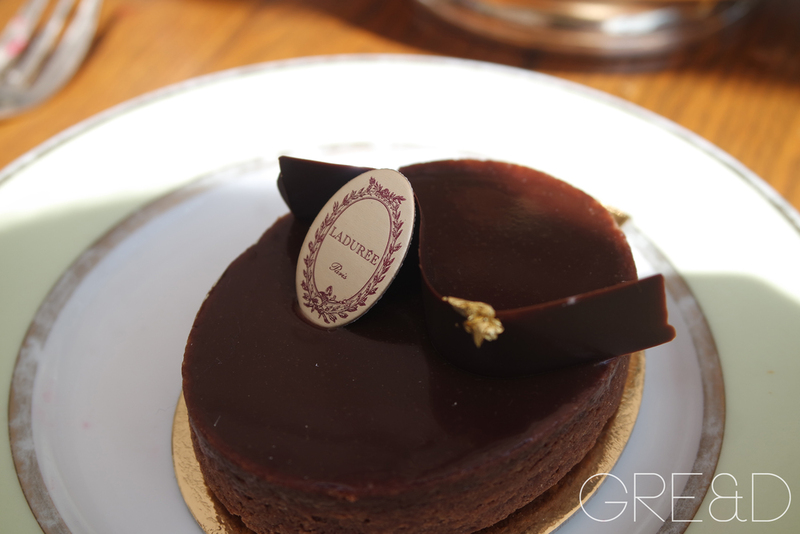 So last week Andrea surprised me by taking me for Afternoon Tea at the Ladurée in Covent Garden. The shop is tiny, and you are welcomed in by high white ceilings and chandeliers. The afternoon tea is spread out across the street into Covent Garden, inside the shop/house and the balcony. As it was a lovely sunny day in London (a rare occurrence) so we decided to sit on the balcony. You are taken upstairs into what feels like a old house. There are a variety of plush velvet loveseats and gold guilted chairs. It's all very cosy but I like that. Outside on the balcony were the iconic pastel green colour of Ladurée seats. Once we sat down we were handed two menus, one green and one blue. Green being the food and blue for drinks. I must admit I didn't realise how much food they did! It wasn't just pastries and cakes, it ranged from mini burger sliders to omelettes. The same with drinks, around 50 different teas and iced coffees to fresh fruit juices. After selecting the afternoon tea which is £27.50 each we had to pick each; 2 finger sandwiches, 2 viennoiseries, 2 macaroons and 2 pastries which also comes with tea/coffee or if you ask Andrea and I chose iced coffees because it was so hot! Apart from the sandwiches we asked for one of everything which meant we could try a little of it all. I felt that the sandwiches would have been a little better. They were very plain, I had a ham and a smoke salmon one which felt a bit dry. But nevertheless they were still lovely and the only savoury part of the set, which I probably should have saved until last as I was on a bit of a sugar rush after! We both made our way through the croissants and pan au chocolat which one was flavoured with pistachio and the other plain. However I must admit the main stars of the dish was pastries. They were so beautiful I really didn't want to eat them. I picked the Raspberry Ispahan which is similar to a macaron but in the middle are whole raspberries and a rose cream. I wish I could eat them all day but minus the calories! Andrea had the Lemon Tarte and then we both shared the Plaisir Sucré and the Carré Chocolat. Both very chocolatey and sweet. Towards the end it was a super struggle to eat anything else that sweet, I was on such a sugar high. Andrea ordered a fresh grapefruit juice to balance the sour with the sweet. I decided to leave the macaroons for last. I had requested that I had a rose one as thats my favourite flavour, although I would never complain to any flavour that I have. The other ones we had selected for us were salted caramel, raspberry and pistachio which were demolished within 5 seconds. I was quite surprised that even though we didn't actually eat a lot, because it was all so sweet we were both quite full. 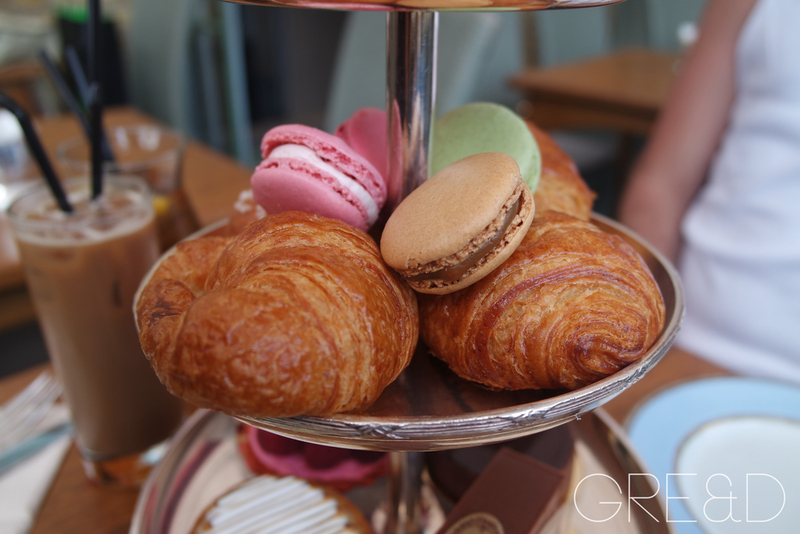 It was lovely to sit outside and enjoy the hustle of Covent Garden and eat beautifully crafted pastries and macaroons. 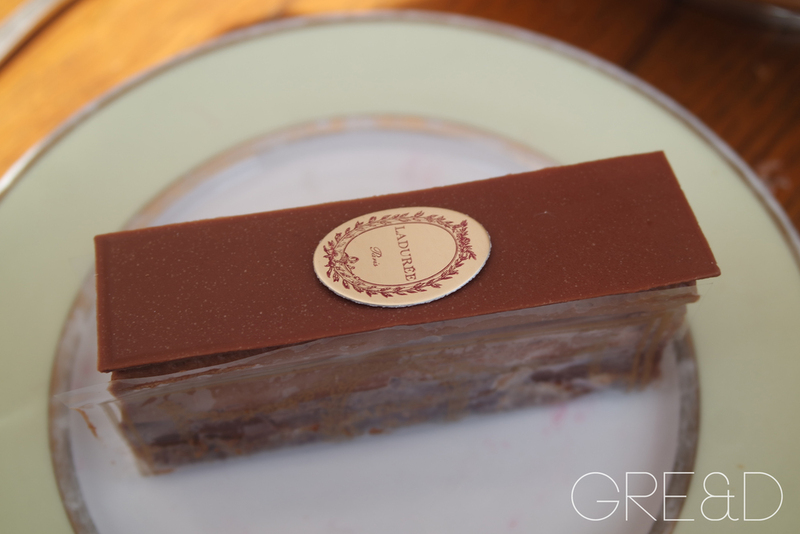 The only problem with wanting to eat at Ladurée is that you cannot book. It is simply 'first come first serve' and for once we were lucky getting a table as every time I walk past, the queue is out of the door and with over an hour and half waiting time. However if you want the experience of Ladurée you can also go to Harrods and inside the store. 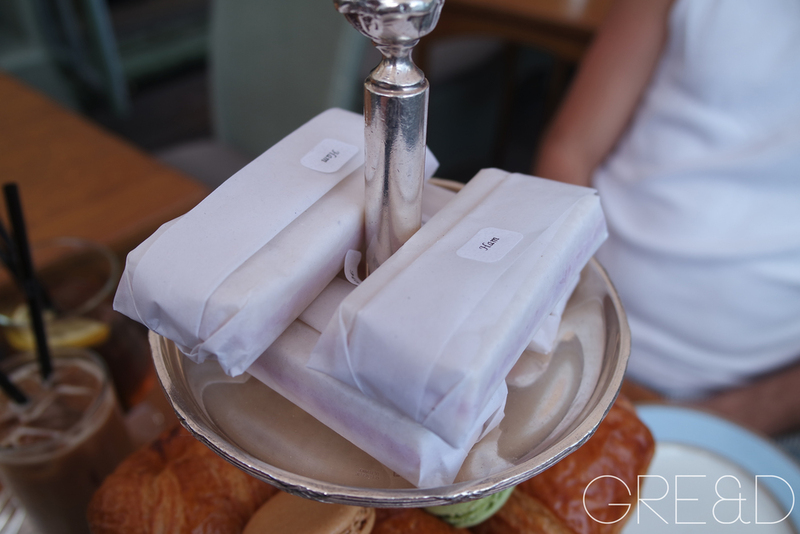 I think it is something that you shoudl experience especially if you like Parisian style, pretty pastel plates and of course macaroons!